You can remove your email address from the mailing list at any time by sending an email to enquiries@clairehowieson.com or by using the enquiry form on the contacts page. 26 November 2016 - Histon Handmade with 14 other artists. 9-10 July and 16-17 July 2016 - Cambridge Open Studios with Jeremy Nicholls (woodworker) and Heidi Lichterman (textiles). 24 November 2014 - Cambridge Christmas 2014. Fifteen artists and makers under one roof. 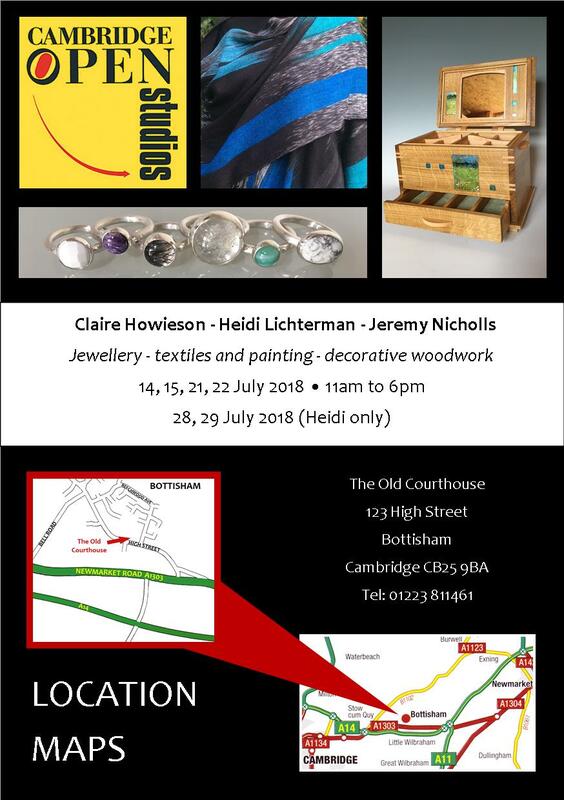 12-13 July and 19-20 July 2014 - Cambridge Open Studios with Jeremy Nicholls (woodworker) and Heidi Lichterman (textiles). 13-14 July and 20-21 July 2013 - Cambridge Open Studios with Jeremy Nicholls (woodworker) and Heidi Lichterman (textiles). 14-15 July and 21-22 July 2012 - Cambridge Open Studios with Jeremy Nicholls (woodworker) and Heidi Lichterman (textiles). 3-4 July and 10-11 July 2011 - Cambridge Open Studios with Jeremy Nicholls (woodworker) and Heidi Lichterman (textiles). 4 - 5 December 2010 - Christmas Open Studios with Matthew Blakeley, Robert Good, Heidi Lichterman and Jeremy Mulvey. 9-10 July and 16-17 July 2010 - Cambridge Open Studios with Jeremy Mulvey (painter) and Heidi Lichterman (textiles). 3-5 April 2010 - Art exhibition at Granchester Village Hall with Sue Brock-Hollinshead (Photographer), Ann Miles (Photographer), Bryan Parker (Photographer), Denise Spalding (Painter), Harriet Wilson (Textile Artist), Ian Wilson (Photographer). 12 December 2009 - Art exhibition at Henry Martyn Hall, Cambridge with Neil Christie, Jane Evans, Jill Fordham and Ann Miles. 4 April 2009 - Handm@de Cambridge craft fair at The Guildhall, Cambridge.